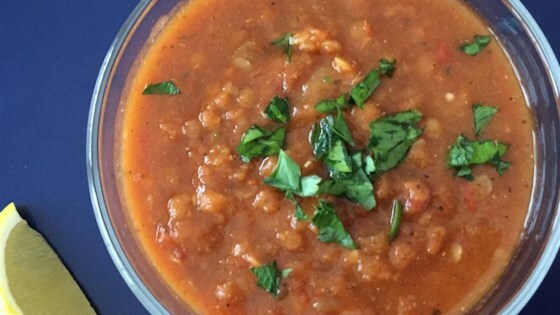 "This delicious red lentil soup is super easy to make and full of flavor. It's vegan as well -- win/win! My dad combined a few different recipes over the years and this one was decidedly the winner. It's been made by many people throughout the family and is always met with great compliments! Cannot emphasize enough that you really need to use red lentils for this recipe as it's key to the taste. If you can't find them in your regular grocery store, they are always in stock at the nearest Indian food market. Best served with your favorite freshly baked bread!" Heat olive oil in a heavy saucepan over medium heat. Add onions and 1 teaspoon salt; cook, stirring occasionally, until softened, about 8 minutes. Add thyme sprigs, garlic, cumin, and bay leaves; cook, stirring, for 1 minute more. Add vegetable broth, tomatoes, red lentils, tomato paste, oregano, remaining salt, and pepper to the saucepan. Cover partially and simmer, stirring occasionally, until lentils are very soft and falling apart, 30 to 45 minutes. Discard thyme sprigs and bay leaves. Let soup cool briefly, about 10 minutes. Transfer 4 cups of soup to a blender; blend until smooth. Mix back into the saucepan. Stir in water. Ladle soup into bowls; garnish with chopped parsley and a squirt of lemon juice. Soup can be made 3 days ahead. Cooled it uncovered. Then it can be chilled, covered. Substitute 1 California bay leaf for the Turkish bay leaves if preferred. Great as is, complex flavours yet simple to assemble. Get thicker when served the next day, yummy and healthy.